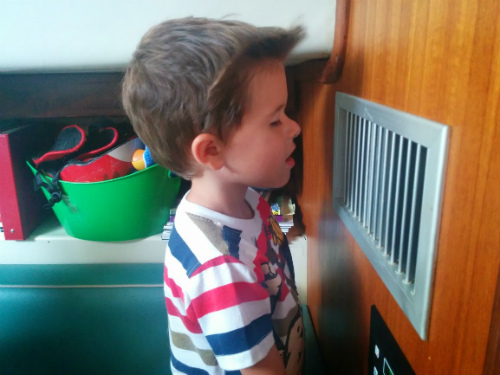 Home » Posts Tagged "living on a boat"
Sometimes you just need a little fresh air before tackling a smelly job! Warning: this post is about a fairly disgusting event on the boat. Read at your own risk! Living on a boat really stinks sometimes. And by that I mean makes you want to wretch and go get some fresh air kind of stink. Small spaces with minimal air flow can turn into some seriously horrendous smells if not fixed quickly. 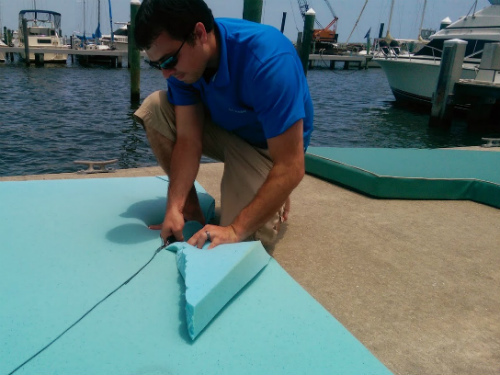 Any combination of diesel fuel, oil, gray water, black water, or delightfully unreliable marine refrigeration problems can turn a good day into a very, very bad one. Luckily, both of us have fairly strong stomachs but they have certainly been pushed to the limit more than we had thought before buying our boat. 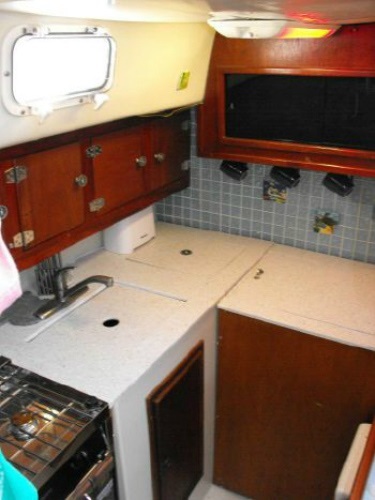 Our galley when we bought the boat. The deep freezer is in the cabinet on the right. 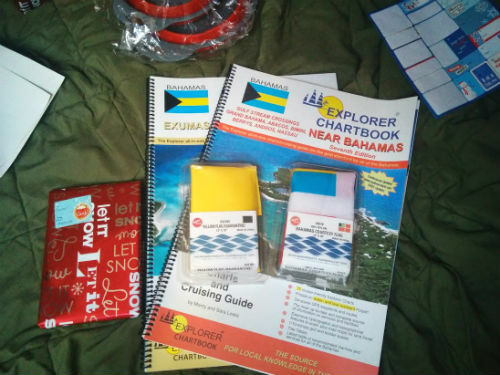 Our first such experience happened only in the second week we were on board (welcome to cruising!) On the trip down from Illinois, we had brought our remaining stash of venison from last year’s hunting season, knowing that we had both our 120V freezer and our 12V marine refrigerator/freezer on board. One of the first things we did upon arrival was fire up both of them to ensure that they were in fact cooling well and then loaded up both freezers with whatever meat still looked in good condition after the trip, about 30 pounds in all. I loaded up the fridge/freezer with the items I’d want to use first as the 120V chest freezer was a bit of a pain to get into. For the next week, we did not check the new freezer again since we had a lot of other things on our minds at the time, one of which being our first move from Indiantown to Stuart. We knew that the 120v wouldn’t be on during the trip but figured that 5 hours inside of a fully frozen freezer would be no problem to keep our meat frozen. That probably would have been true…if it had ever turned back on. Three days later we started to notice a slightly sour smell when we walked into the boat, but I couldn’t figure out where it was coming from. Two days after that, it was strong enough for me to find it. Let me just say that there is nothing I have thus far encountered, even after making it through potty training with a little boy, that smelled quite as horrible as when I opened up that freezer. Twenty pounds of bloated meat sitting in its own juices was a total nightmare to clean up, especially since it was in the bottom of a deep chest freezer that I had to dive in to reach the bottom. Two hours of holding my breath to try to keep from gagging was not a great way to spend an afternoon. Even after cleaning it with bleach, baking soda, and vinegar I still wasn’t able to completely get rid of the smell of rotten meat. I’m not sure I’ll ever be able to eat venison again. We are still trying to find the perfect temperature to defrost time ratio. If something smells bad, find it now. Do not wait for it to get worse or you will regret it. When dealing with a new refrigeration system, check it multiple times before you trust it. 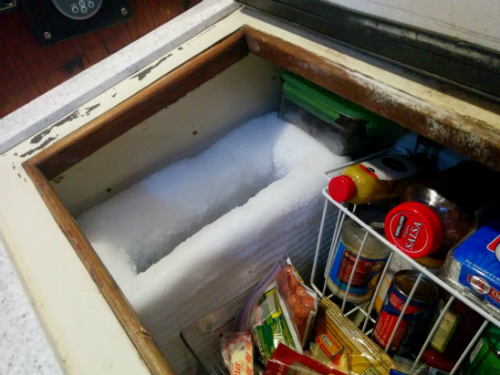 We’re still not sure if the freezer was working fully to begin with or not. In the end we decided to get rid of it anyway due to the smell and not wanting to get used to using the 120V freezer since we wouldn’t be running it at anchor. It takes a while to get used to using a marine refrigerator even when it works correctly. Multiple items have thawed out on me that I thought would stay frozen at the top of the freezer and others have burst from sitting too close to the cooling coils. Finding random ooze at the bottom of your fridge that is now somewhere down the drain into the bilge is never a good thing. Consider installing a separate sump for your refrigeration (and shower water). We haven’t yet done this but are planning to in the future. 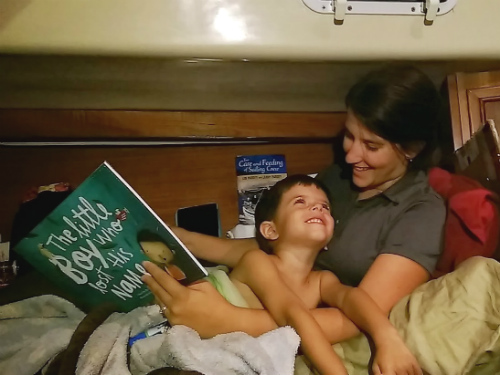 If this same story had happened with the drain plug opened, we probably never would have gotten rid of the rotten meat smell out of our boat which would have really been a damper on living conditions. Any bacteria that gets into the bilge is probably going to stay in the bilge for a long, long time especially if yours is very deep and hard to clean completely like ours is. 120V refrigeration on a boat doesn’t make a lot of sense unless you are planning on running a generator or being plugged into shore power full time. Even then I think we would prefer a 120/12v option for those times when you are moving or even just want to go out for a weekend. Take it from me, you do not want to be spending an otherwise lovely day draining rotten juice one paper towel at a time. 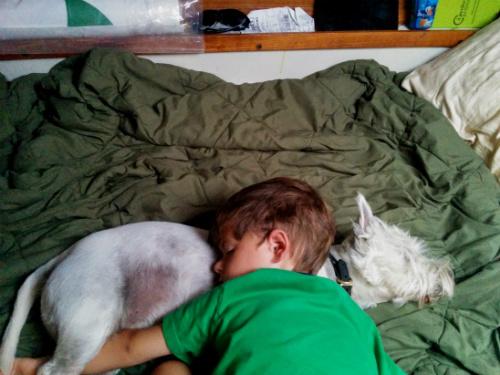 With two dogs and a little boy, sleeping is a favorite activity on board. Getting a good night’s sleep is one of the most basic living comforts and one of the most noticeable when it is missing. 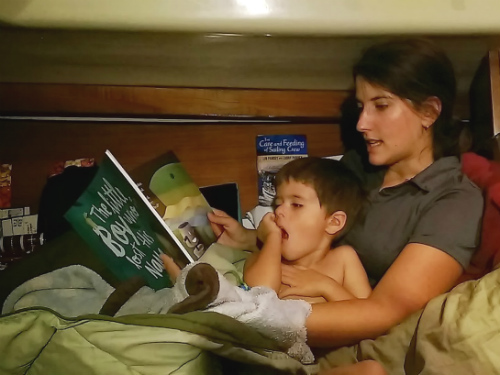 Making our master stateroom bed on Horizon into a restful space has been an ongoing project for me from the first day we moved on-board. When most people think about making a bed, they probably think sheets and pillows. For us it has run the gauntlet of improving the rock hard cushion mattress, sewing our own sheets and eventually making a V-berth capstone cushion (also called an insert cushion.) For this post I’ll be covering how we updated our mattress and my many attempts at sheet making. The v-berth cushion I’ll cover more in depth on a future post about using a Sailrite machine. The original mattress cushions were quite uncomfortable and hard to make! Within only a week or two of moving on board, Dan and I were both waking up feeling 30 years older every morning. Our backs were aching, hips and knees were acting up and both of us felt generally immobile when we got out of bed. We knew that we could not continue sleeping on 3 inch high density foam or else we were likely to start developing spinal problems! Our first plan was to buy a full 10 inch memory foam mattress and cut it to fit, but after discussing it with some fellow live aboards, we decided to try a 3 inch memory foam topper from Costco first instead. At just over $100 for the king size we figured it was worth trying before shelling out significantly more for a full mattress. Doing the cuts out on the dock gave us a lot more work space. We brought the topper home and opened up the box. As it began to expand inside the boat (the foam is vacuum packed inside the packaging to reduce its size) we realized that there was really no way to properly measure without some significant floor space. So out on the dock we went with our new topper, our old mattress, a permanent marker and some scissors. 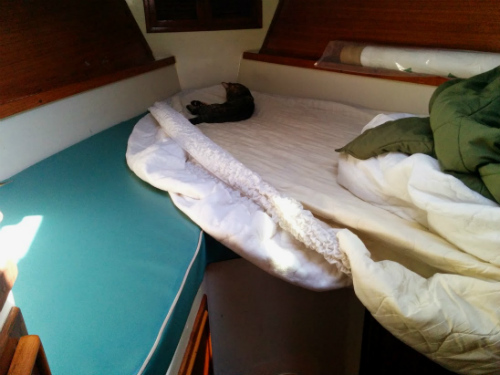 In our case, our v-berth is slightly wider at the head than a standard king size mattress so we had to do some creative cutting to have enough foam to cover the whole space. We ended up with three pieces: one for the main body of the bed, and one for each of the head pieces. Using our kitchen shears and razor blade for cutting the foam worked marginally well, but most people I talked to said an electric knife is the best bet and I tend to believe that would have been a much cleaner option. To make the insert portion, I made pieces that had to be inverted. The sheets were not such an easy fix. 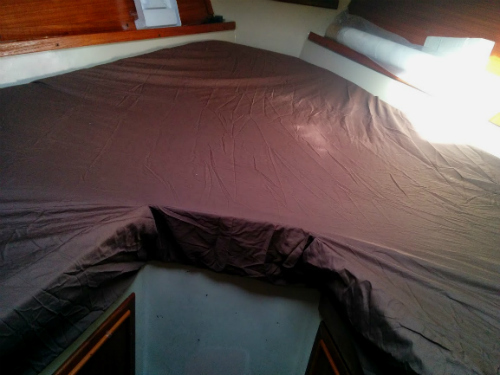 Our problem was that without a capstone cushion our v-berth couldn’t even use specialized v-berth sheets; they would have to be custom. After a few failed attempts at cutting and tucking standard king sheets, I decided that I would have to take a more active approach. I brought a standard sewing machine with us when we moved onto Horizon and even though I am a fairly novice seamstress, I was going to do whatever it took to have a decent looking set of sheets. (Including buying the cheapest sheets at Walmart just in case it was a total failure!) 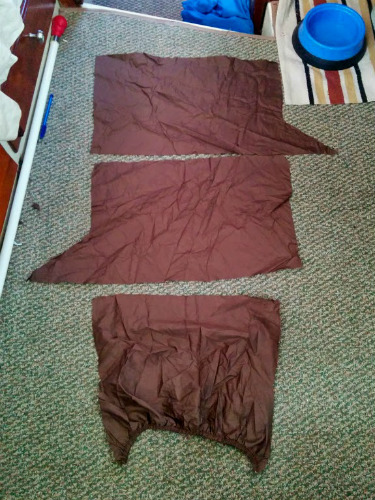 My first step was cutting a thin triangle out of each side of the fitted sheet and then sewing the sides back together in order to have a tighter fit around the bottom (pointy) part of the mattress. After many attempts, the sheets finally fit! Then came the tricky part. In order to make the inside u-shape I cut a straight edge around the top of the mattress, then cut inverted shapes to act as the sides and bottom of the mattress. In the end, the sheets turned out fairly well and have held up to the abuse that the three of us have inflicted over the last 5 months. The only other addition we’ve made is some sheet suspenders to help the sheets from sliding out from under the slippery mattress. Our bed is now soft, comfortable, and looks nice too! “How would you carry a laundry machine up a mountain?” This intriguing question was part of a Scrubba Washbag commercial that made me take a closer look. I had been looking for a solution for laundry on board, but hadn’t made up my mind on what I wanted to try as my first manual washing experience. 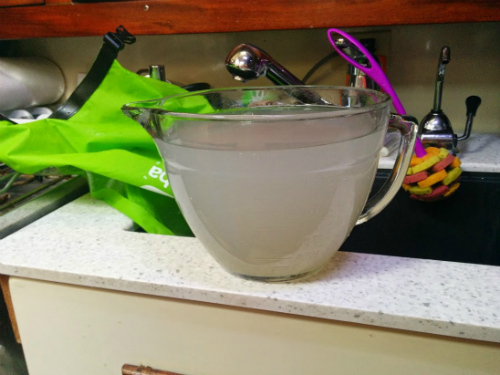 Our friends on Cool Beans showed us their preferred method, essentially a modified plunger in a bucket, which probably would have been what I tried first if I hadn’t seen the Scrubba on a facebook group called Women Who Sail. I liked the idea of the smaller footprint of the Scrubba bag and thought it might be better for us due to our limited space. When Dan spotted it on a Woot.com sale, I decided to take the plunge. The bag folds up quite small when you aren’t using it. First of all, let me say that the price point is a bit high in my opinion. 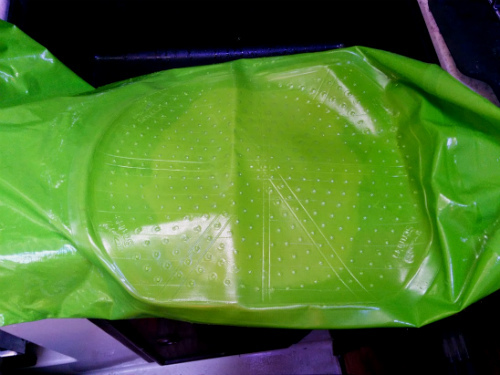 At $55 for what is essentially a 3 gallon dry bag with some bumps inside, it took me some serious consideration before I decided to buy it. Even after using it, I’d still say the price could have been a bit cheaper but it is fairly new so it may go down in price in the future, especially since it has already come down $10 since I first looked at buying it. Since I ordered it from Woot.com, I can’t say much about the customer service directly from the company or their shipping time, though they do offer free shipping to anywhere in the United States and internationally I believe. It was easy to tell how full to fill the bag. The packaging was totally rage free and user friendly, which is always nice. My first impression was that the material was a bit thinner than I had expected but it still seemed pretty sturdy. After using it for multiple large loads, it held up with no problems though I was still careful not to use my fingernails too much when massaging/washing the clothes. The overall appearance is pleasant and I especially liked the clear window on the side with water-fill suggestions for load size. I will say that the air vent (very similar to one on a beach ball) was almost impossible for me to function but Dan had no problem getting it to work, so it’s either a hand strength issue or a brain issue I’m not quite sure at this point. Let’s just say I will never do this much laundry at one time again! The Scrubba could hold a decent amount at one time while still getting everything clean. The dirty water from just one load. It certainly is getting the clothes clean! Here is the inside of the bag. 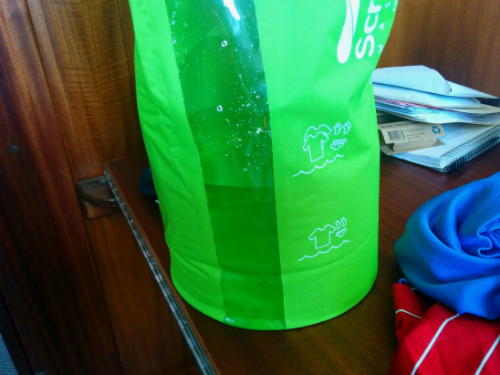 You can see how the wash board would be different than a normal dry bag. The cleaning power of having the washboard inside the bag was also very helpful. At least of few of the pieces I washed had visible dirt/stains on them before washing but afterwards came out clean (I did spray them with a bit of Spray n’ Wash first). 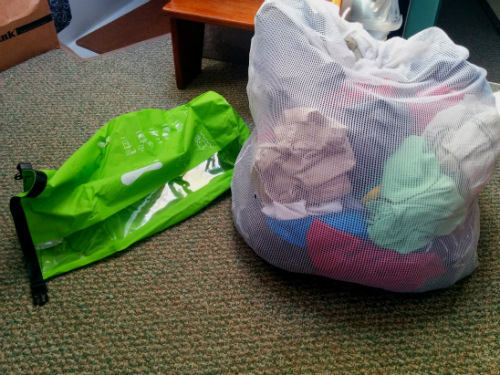 If you had anything that was heavy soiled, it would probably be better to do a pre-rinse of that item first just to reduce the transfer of oil or other junk onto your other clothes or the inside of the bag. The official recommendation for soap used is basically any washing liquid (as opposed to powders) and even shampoo or body wash would work in a pinch. I chose to use a dye and chemical free liquid that I got at Costco since I figured that some of the soap would be staying in our clothes without an intense rinse and spin cycle like you would have in a washing machine. You only need a very small amount for each load and I found that putting in the detergent before the water worked best for getting it to suds quickly. 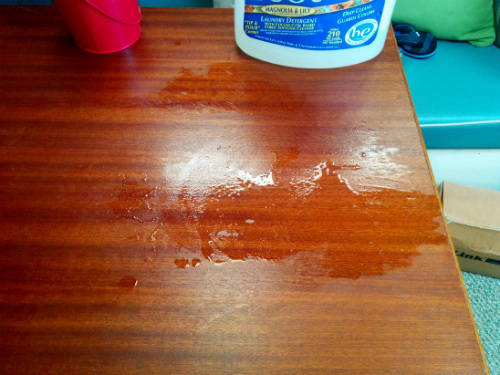 This is our salon table after washing a load. Not a lot of water left over, but enough that I wouldn’t do it on the bed or carpet. 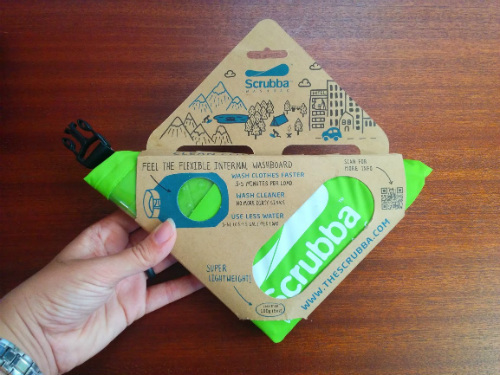 All-in-all I’d say that the Scrubba was easy to use, well made, and good for use on a boat (or other traveling) due to its compact size and only using about 1.5-2 gallons of water per load. There are a few caveats, however. First, due to there being a lot of water transfer going on, I would not recommend doing your washing on top of a bed or carpet area as there is some water that will get on your work surface. Nothing too drastic but just something to know ahead of time. Also, even with hand wringing the clothes are still very wet compared to an electric machine. The guys at Scrubba sell a microfiber towel to roll/squeeze the water out in and I would highly recommend using something similar if you want your clothes to dry in any reasonable amount of time. Or you can do your own version of a spin cycle by doing the windmill on the back of your boat, your choice. 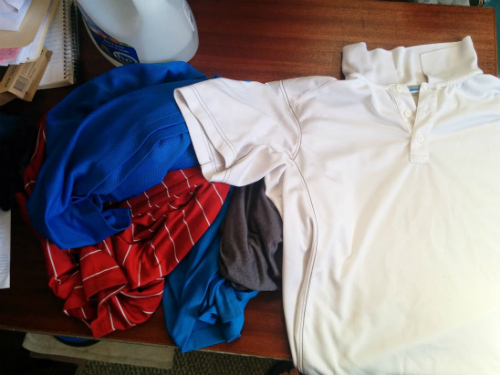 Have you had any experience with a manual clothes washing system that you would recommend? Tips or tricks for us? Let us know in the comments! The year 2014 will go undoubtedly be ranked among the most significant of our lives. This was the year that all of our planning and saving culminated in moving 1,000 miles onto our own Irwin 37. Though at times we experienced incredible stress and frustration, there were far more moments of joy, excitement, and true wonder at our new life. We look back on this year with a great feeling of accomplishment, knowing that so many have never reached such a tangible realization of their dreams. It is with that knowledge that we head into 2015, having faith that what is to come will be greater still. We hope that you will join us as we continue to Follow the Horizon. 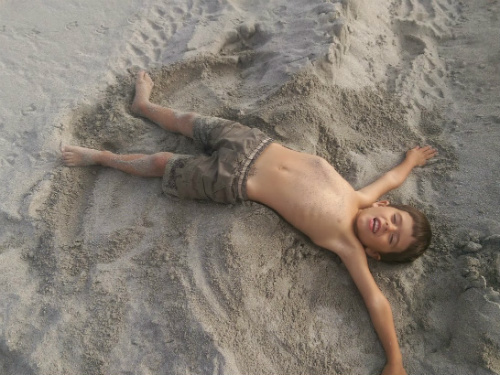 We don’t have snow, but there’s nothing wrong with a sand angel on Christmas day instead! The weeks coming up to Christmas this year were a flurry of packages, Christmas cards and Skyping with family. 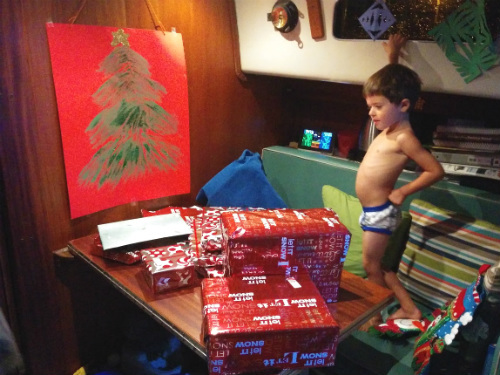 As our first year on the boat and the first away from family, it was important to us to make Christmas special and establish a bit of our own flair. I had the idea that I would have a fabulous menu planned with all of our presents perfectly wrapped and under our “tree” on Christmas morning ready to go. It turns out I was a little over ambitious on the menu side for my first try (I’m sure I’m not the first person to find that out! ), but we still had a great time complete with a visit to the beach! Our table was piled high on Christmas Eve! One of the bigger challenges for us this year was trying to coordinate presents for Carter from the extended family. Because his birthday and Christmas are only about a month apart, finding enough gift ideas has always been an issue but this year it was especially so. Unfortunately, most gifts for his age range are space hogs featuring near life-size vehicles, sports equipment, and monstrous play sets. Seeing as how we are a little short on garage space, we had to a little more creative for him and us. My sister Melissa got Carter a set of Ninja Turtle books. Now I just have to find time to read them. Luckily for us, his friends on Viatori introduced Carter to the wonderful world of Lego only a few weeks before his birthday. 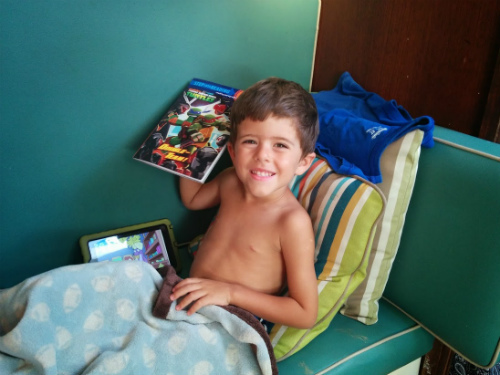 Legos are perfect for boat life since they can be endlessly rearranged in new ways and store into a fairly compact space. Five separate sets of Lego Junior later and a general bucket from Grandma means we are now a fully stocked Lego vessel. Carter also scored some new books, a few superhero costumes, and some new DVDs to add to the collection. We got Carter a custom book called “The Little Boy Who Lost His Name”. This is us reading it just before he finds out it is about him. Here is his face when he finally figured it out! Planning for our trip in the full sized charts is much easier than on a screen! While we missed the family, we still had a great day together and are already enjoying our new gifts. Another Christmas success! I Can Hear Clearly Now, the Pain is Gone!